I once attempted to make gnocchi... attempted, and failed miserably. 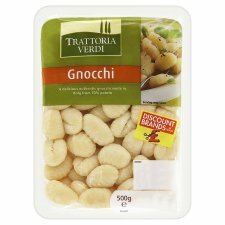 Which is why I was rather excited today to find that Tesco now stock their own brand of Gnocchi that is vegan! I took them straight home, whipped up some pesto and have just finished munching down on one seriously good gnocchi dish - my new favourite 5 minute meal! To make the pesto, simply blitz all of the ingredients in a food processor until very smooth. Add the different oils until you reach a consistency that you like and then salt to taste. Bring a pot of water to the boil and add in the gnocchi. After about three minutes they will rise to the top and they are done. Simply drain, mix through a few big spoonfuls of pesto and serve. I like to make pesto once a week and just keep it in the fridge for a quick after work meal. Notes: I like my pesto to be really salty and garlicy if I am using it on pasta, so put in less of each if you prefer a milder taste or are planning to eat it on bread as a dip.